M&S is one of the UK's leading retailers, with over 750 stores nationwide. Use your e-gift card to treat yourself to any of our fantastic food, wine, clothing, homeware, lingerie or beauty online or in-store. 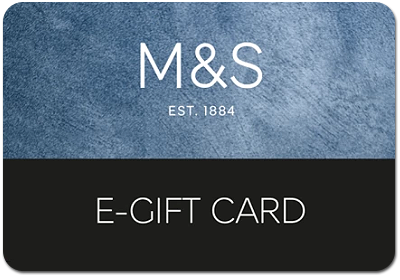 E-gift cards can be redeemed at M&S stores in the United Kingdom, Eire and the Channel Islands (including Outlets but excluding BP stores) and online (subject to website terms and conditions). They may be exchanged for goods of a higher price than the face value of the card on payment of the difference. E-gift cards cannot be exchanged for cash or used to pay for M&S Bank services, products or outstanding card balances, made to measure shirts, Lunch to Go, personalised cards or M&S Energy or to buy another gift card or e-gift card. Gift cards and e-gift cards, or a combination of, are restricted to a maximum of five that can be redeemed in any one transaction online. Gift cards and e-gift cards are valid for the period which is the later of (i) the date shown above, or (ii) 24 months from the date of the last transaction. After the expiry of this period any remaining balance will be cancelled. Balance enquiries can be obtained online or by calling 0333 014 8777 for the UK and Channel Islands (local rates apply) or 1890 719380 for Eire (mobile rates may vary). If any item purchased with a gift card or e-gift card is subsequently exchanged for an item of a lower price or refunded, any money owing will be added to the remaining balance on the card. If you do not spend the entire balance on the e-gift card, the remaining balance will be updated after each transaction. If spent in store, the remaining balance is shown on your printed till receipt. E-gift cards should be treated as cash. They are not cheque guarantee, credit or charge cards. M&S will not accept liability for lost, stolen or damaged cards. E-gift cards cannot be returned or refunded, except in accordance with your statutory rights, for example in the event they are not of satisfactory quality. M&S reserves the right to amend the terms and conditions of e-gift cards at any time and to take appropriate action, including the cancellation of the card, if, in its discretion, it deems such action necessary. This does not affect your statutory rights.